Simply Soccer is capable of providing you private training. Players have an opportunity to train in an individual or small group setting where the coach-to-player attention and coaching time is at a maximum. We schedule sessions for a time and location that suits both the player and the trainer. Sessions usually last 60 minutes in duration and players will be trained in technical and tactical areas of soccer. The player can request to work on certain areas for their game or you can let a trainer assess your skill, your playing position and your physical attributes and we will identify training needs. These sessions are designed to offer a more individual approach to training. Players will benefit from a session uniquely tailored to their individual skills and needs. A trainer will work with the player to build players strengths, minimize weaknesses, and reach the player's personal goals and potential. Players will get many touches of the ball, working on all surfaces of the foot, working on such areas as control, turning, weak and strong foot training and heading to name a few. Players can also request 'positional training' where our trainer would work on the primary skillset for the young players position, for example a striker would work skills such as on control from ground and air (back to goal/side to goal), shooting, finishing (ground/air), off the ball movement, heading and goalkeeping. 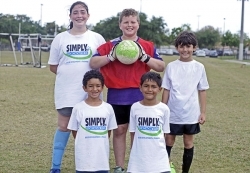 Simply Soccer offers the opportunity for small groups to develop specific skills and methods of play. These sessions are designed to concentrate on the individuals' needs, in addition to incorporating small game-like situations. This option is a great mix of individual attention and small group coaching. Groups can be made of teammates looking to work on a specific tactical aspect of play, or just practice their own technique in challenged situations. 5 or more players please contact us for special pricing.